Fort Wilderness is Disney's camping experience, suitable for tents or RVs, filled with hiking paths. Designed in an old Keys West theme, this Disney Vacation club offers villas and extra hours at one of the Theme parks. This Disney Vacation club is set on the grounds of the Animal Kingdom, with African-inspired villas. A wilderness setting with American craftsmanship is the site of this Disney vacation club villa enclave. The Beach Club Villas of Disney have croquet on the grounds, which are designed in a sea-side style. A waterfront resort, the Disney Port of Orleans evokes Mississippi in its décor and ambiance. This resort is located in Disney's Animal Kingdom Park area and boasts the architecure of Mexico and American southwest. Located in Downtown Disney area, this resort is New Orleans inspired. 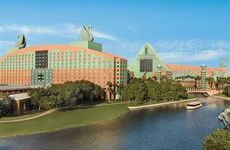 This resort is in Disney's Wide World of Sports Complex and celebrates 20th-century pop culture. Situated in Disney's Animal Kingdom Park, this resort celebrates the magic of music. 275 room resort features full kitchens in all villas and is conveniently located near Walt Disney World and Sea World. 626 room family friendly resort featuring thrice weekly breakfasts with the Disney characters. Discover for yourself why business travelers and families on vacation all choose the Hawthorn Suites Lake Buena Vista.